Cook an awesome Tortilla Soup for your family tonight. 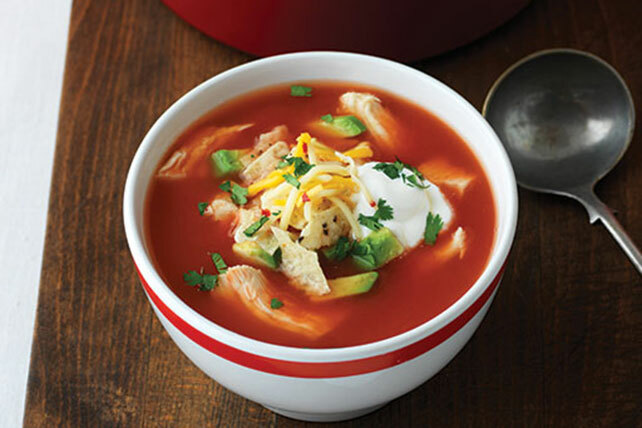 Our Tortilla Soup starts with chicken and adds tomato sauce, cheese, avocado and cilantro. Cook dressing and garlic in large saucepan on medium-high heat 1 min., stirring occasionally. Stir in broth and water. Add chicken. Bring liquid to boil; simmer on medium-low heat 20 min. or until chicken is done (165°F). Remove chicken from pan, reserving liquid in pan; set chicken aside. Pour reserved liquid through fine-mesh strainer into bowl. Discard strained solids; return liquid to saucepan. Shred chicken; add to liquid in pan. Stir in tomato sauce; cook on medium-high heat 5 min. or until heated through, stirring occasionally. Serve chicken mixture topped with remaining ingredients. Serve with a side salad and small whole wheat roll to make a complete meal. This tasty soup can also be prepared using frozen boneless skinless chicken breasts or boneless skinless chicken thighs. For more heat, add 1 chopped stemmed serrano chile to cooked garlic in pan along with the broth and chicken.